The last few weeks have been quite hectic as I was trying to finish a cardigan for my mom before she went back to the States – mission accomplished. The pattern is another Knitty pattern, Mr Greenjeans and I used James C Brett Pure Merino. It went by really quickly after I finished all the big stockinette stitch parts. Even though the temperature was fairly mild when I tried it on and I get hot quite easily, it’s really warm and I think it will make a good winter cardie. It would appear that the only things I knit are from Knitty because I’ve had another Knitty pattern,Calorimetry, in my queue for a while and decided to finally cast on since the weather is getting cooler. The idea behind the headband is that it will keep your head warm since that is where the most heat is lost, while also being able to keep your hair pulled back, which is very difficult to do whilst wearing a hat. It’s pretty much a dream come true for me as my long, thick hair acts as a scarf and I’m often too hot when I wear a hat and can’t comfortably pull my hair back, or it’s just really windy and my hair blows in my face and I can’t see. I used King Cole Mirage for this project, and bought this particular colour as an impulse buy because I was blinded by the pink; it reminds me of cotton candy. I’m thinking of making some matching fingerless gloves with the left over yarn (Mirage is a BARGIN with 343 yards/314 meters per 100 g). I used a little whale button for the back, which I think is super cute, but a little too small and the tail keeps catching on the yarn when I try to button and unbutton it. To prove that I knit things from other sources besides Knitty, I have also finished knitting the Fresh Bite Scarflet and just need to find some red buttons. Although the creator of the pattern was inspired by Twilight, I feel that I need to clarify that I made this scarf as part of a Buffy/Angel swap and I hate Twilight. * I used King Cole Comfort Chunky, which was probably a mistake because it’s a bit too chunky, but oh well I guess; it’s soft. I still have a few more things to make for the swap and am SO excited about them! Although, I should say that my excitement is based on an assumption that the other handmade items will turn exactly how I have planned them out in my head and the little sketches I’ve made of them. I also knitted the letter ‘W’ for the Poetry Society’s ‘Knit a Poem,’ though there is no picture of it because it was a rush job and looks pretty bad. Sorry Poetry Society! I’m hoping that the final poem will be something ridiculously long like Waste Land; I would love to see that. Along with a few other 8th Day Cafe Knitters, I’m using my veg out time to knit up some squares for the Macmillan Comfort Blanket campaign. Wow! I’ve been feeling like I’ve been really lazy and slurmulant lately, but just realised I’ve been quite the busy bee! No wonder I’ve been feeling like I’m losing my mind in craft projects. My sewing machine is coming out next week and I will be sewing up a storm! *Admittedly, I was sucked into the first three books and first 100 pages of Breaking Dawn. I even own the first three books, but won’t sell or donate them because I don’t want to put them back out into the world. It’s a ways off, so mark your calendar. The Vintage Fair will showcase 40 stalls of vintage and retro fashion along with other fun kitsch stuff, like homewares (personally, I have my fingers crossed for finding a Pepto-Bismol pink vintage telephone). Additionally, there are still some stalls open if you think you may have something to sell. Here is more information about The Vintage Fair in Manchester (directions included). Here is more information about The Vintage Fair in general. Last weekend I attended an all day screen printing workshop at the Urbis, Manchester. I had what I thought were some really good ideas for t-shirts, but they turned out to be a massive FAIL. My whale print was better in my head, but didn’t really translate into a good print because 1) the picture in my head involved better/more technical placement of colours, 2) once I put the board into my shirt to stretch it out for printing, the paper I did the stencil on wasn’t big enough and 3) the picture just didn’t translate. 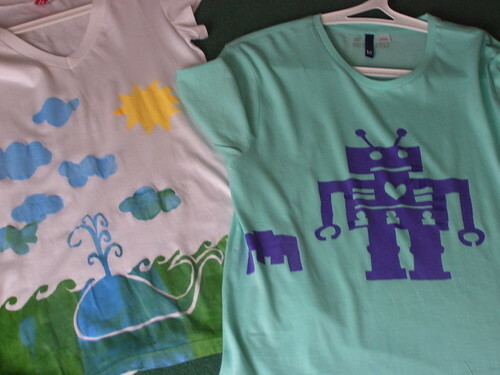 I was really pleased with the robot print until I was trying to fill in the little gaps with paint, which also turned out terribly bad, and smudged a glob of paint I didn’t know was on my arm onto the side of the shirt, hence, the weird space invaders. On a more successful note, I finished the Amy Butler Gum Drop pillow. One of the best things about Amy Butler’s patterns is how extremely easy everything is to make. I have her book, In Stitches and have also made a few of the free patterns from her website and have enjoyed making her designs. She uses simple shapes that usually require very few pattern pieces, if it uses pattern pieces at all and the construction and directions are really simple and easy to follow as well. Yet, the finished product looks incredibly professional and much more difficult and time consuming to make than it actually is. After a week of testing it out on the sofa, it’s a really great project and more comfortable than I originally thought it would be. It’s best as an extra form of back support, as shown in the pattern picture; it’s proved to be an extremely comfortable knitting position as well. There is also enough give with the bean bag filling that you can use it in the same way as a normal pillow for laying on the sofa to watch TV. I will be making an ottoman sometime in the near future. My super awesome husband also got me Let’s Make Cute Stuff by Aranzi Aronzo! Cute Dolls. 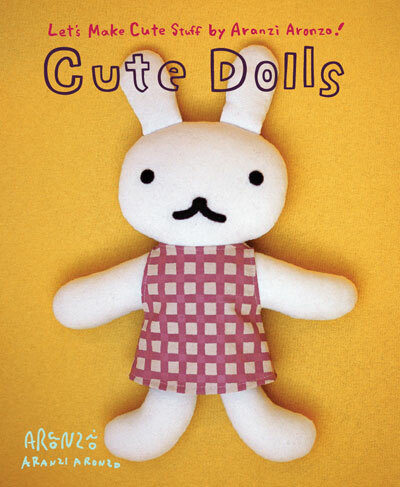 The title is not misleading at all; all the dolls/stuffed animals in this book are super cute!